We have 10 canoes and 4 single person kayaks to rent. Final rental is 3:00 pm. Renter is responsible for transporting. We don't rent if the river speed is over 2,000 cubic feet per second or the river level is over 5.5 feet deep. Nor if the river level is below 2.5 feet. Check River levels HERE. WEBSTER CITY - New bridge construction, just downstream from the Bevers Bridge Access, on the Boone River in Hamilton County is creating a dangerous hazard for paddlers this summer. Thousands of paddlers use this access each year as they paddle down this popular water trail. Six culverts spanning the river are creating an extreme hazard and some re-circulation on the downstream side is possible at certain levels. 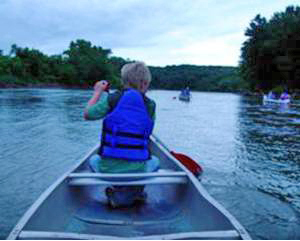 "All river users should avoid this area for the summer season," said Nate Hoogeveen, Iowa DNR River Programs Coordinator. "From upstream, take out at the Albright Canoe Access or Bever Bridge Access or put in your watercraft at Tunnel Mill Canoe Access downstream."